[EN] I’ve long been an ardent fan of Rixdorf, that well-preserved, former Bohemian village in the heart of Berlin’s hip Neukölln - probably because I come from a quaint small town (in Poland) myself. Despite being located close to the bustle of Karl-Marx-Straße and Sonnenallee, this village-esque part of Neukölln has remained sleepy, idyllic and even relatively tourist-free compared to other parts of the district. The original German village that was here dates back some 600 years, though its history as the city’s ‘Bohemian quarter’ harks back to 1737, when it was settled by a group of around 350 Moravian Protestants. Expelled from Eastern Bohemia, they were invited by Prussian King Friedrich Wilhelm I, who used them to repopulate what was then a fairly desolate and outlying part of Berlin. Hailing mainly from the Czech town of Ustí nad Orlicí, they settled along and around Kirchgasse, just north of the older German village, where they continued to maintain and develop their community (Český Rixdorf). Sixty years later, the religious settlement gained its own administration and the area became known as Böhmisch-Rixdorf, the older German part becoming Deutsch-Rixdorf. These two independent municipalities unified in 1874 and its population increased significantly in the following years. By the end of the nineteenth century, following German unification and the city's subsequent economic surge, Rixdorf took an unlikely turn and developed into one of the city's primary entertainment zones, a nocturnal playground full of taverns, dancehalls and theatres. By 1912, the name of the neighbourhood was so associated with raucous and disreputable behaviour that the name was changed to Neukölln in an ambitious attempt at rebranding. Despite this and the subsequent turmoil of the twentieth century, traces of the old Bohemian village core remain: a smattering of original old buildings and cobblestoned alleyways, as well as glass-paned lamps and even horse stables like the ones belonging to Gustav Schöne’s company at Richardplatz 18 (which still actually contain horses). 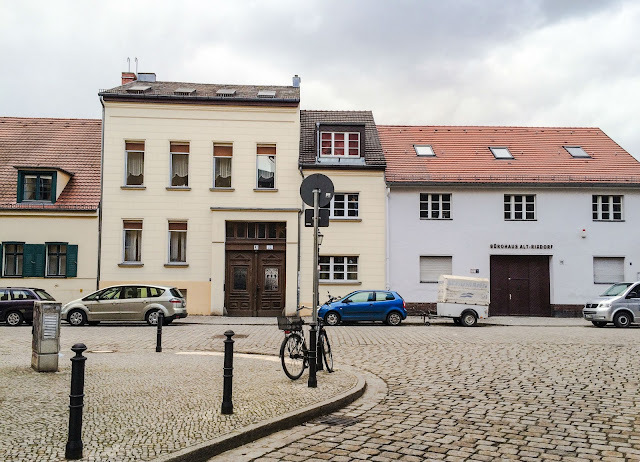 Some of the street names also originate from Bohemian family names - Schudomastraße, Niemetzstraße, Mareschstraße - and a few descendants of the original Czech exiles still live in the neighbourhood and work hard to take care of their heritage. One of the most popular annual events they have resurrected is the Rixdorfer Christmas Market at Richardplatz, often regarded as one of the most charming in Berlin, as well as the almost forgotten tradition of ‘Popraci’ (‘Strohballenrollen’ or hay-bale rolling). But these are merely the historical elements. As with elsewhere in the city, Rixdorf has also adapted to the contemporary needs of its residents with a decent array of modern bars, restaurants, shops and attractions, all of which combine to make for a relaxed and interesting day of exploring. First, coffee - and maybe breakfast. If you're visiting through the week and want something simple, quick and cheap, pop into the Turkish bakery at Richardplatz and pick up a suczuk or menemen or other ‘Frühstück’ delights and walk away with change from 5 euros. If you’re a coffee aficionado, head to Geschwister Nothaf (Schwarzastraße 9), whose purple-painted door and window frames lead into a white-walled interior and a wealth of delicious juices and shakes, plus croissants, grilled sandwiches and homemade cakes. The best sit-down, indulgent midweek breakfast is arguably to be had at the megy-cosy Café Dritter Raum (Hertzbergstraße 14, open from 10am but closed Mondays). Settle into one of the sofas, pull out a board-game - or try the video console - and enjoy the appealing flea-market-decor as you work your way through pancakes or a full English breakfast, all available up until 2pm. If you’re a health buff, don’t fear: Rixdorf can provide. Sustainable food spot Cafe Botanico (Richardstraße 100, open from 12pm daily) has decent Italian-style espresso, lovely wooden floors and a very pleasant garden patio. Another place nearby serving natural, healthy food - including gluten-free dishes - is CocoLiebe (Richardstraße 107, open from 1pm Mon-Fr, from 10am at weekends), a colourful place with an international clientele, fresh juices and quick breakfasts; their Flammküchen-esque pizzas often come with unusual flavours and they often have concerts and exhibitions from local artists. If you’re starting late and visiting at the weekend, then there are a couple of good brunch options. The afore-mentioned Café Dritter Raum (Hertzbergstraße 14, open from 10am but closed Mondays), has a weekend brunch from 10am until 4pm that’s 90% vegan - but if you want 100% then nearby Café Vux (Wipperstraße 14) is your place; this Brazilian-inspired vegan cafe hosts a quite famous and delicious all-vegan Sunday brunch between 12-3pm. Now you’re ready to walk and explore. 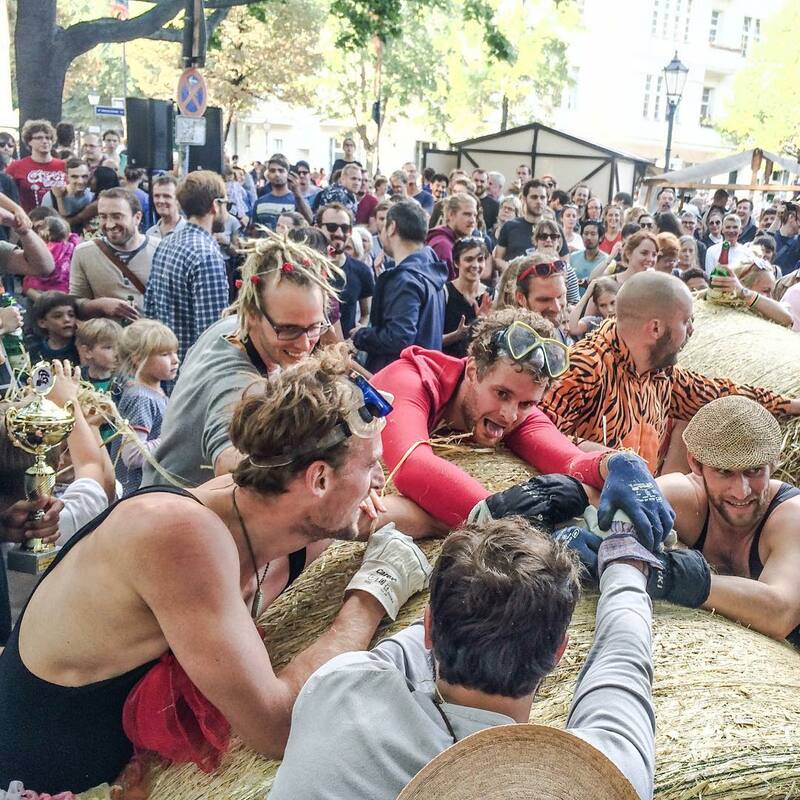 The best place to begin is the heart of the district, namely the long and narrow plaza known as Richardplatz. Here you’ll find plenty of traces of the area’s history, such as the handsome Evangelisch-reformierte Bethlehemsgemeinde (Bethlehem's Church) in the centre of the square (No.22). Originally built in the late seventeenth century to replace a former village church that burned down, it still hosts occasional services and choir concerts; the acoustics are said to be excellent. Across the street is the afore-mentioned - and even older - Gustav Schön smithy (No. 18), which dates back to 1624 and today hosts a women’s centre and art gallery. 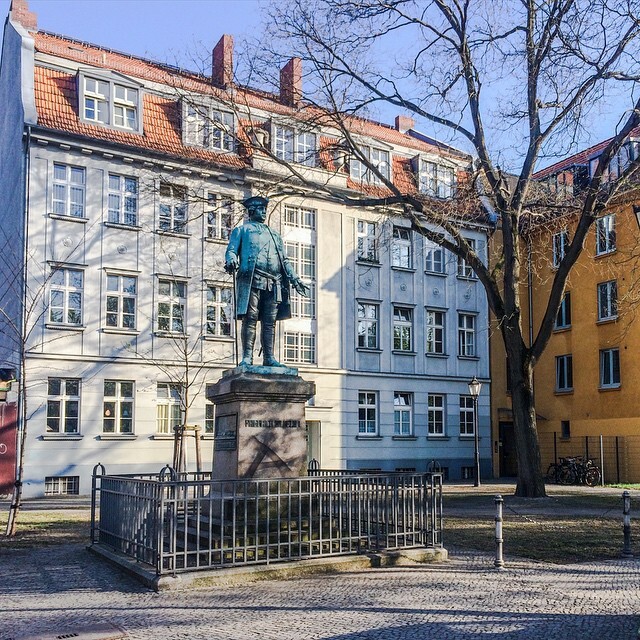 From here, head north along Richardstraße where you’ll find the small but delightful Comenius-Garten, which commemorates the life and work of Moravian philosopher Johann Amos Comenius (1592-1670). It’s not the easiest place to visit since it’s not open on a regular basis, but if you’re lucky you can press the silver button on the right hand side of the entrance and find yourself in front of a small pathway that beckons visitors into a in a tiny but verdant oasis of fruit trees, a tranquil pond, and a pavilion. 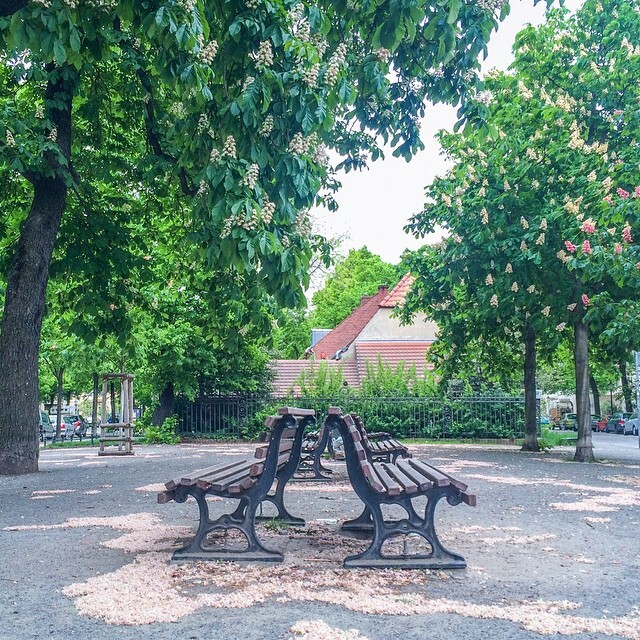 It’s take all of 15-minutes to explore, but its reflective aura is timeless and it’s worth taking a seat on one of the benches that invite temporary escape from the city bustle. Upon leaving the garden, head down the cute Kirchgasse to find the small Museum im Böhmischen Dorf, which occupies a former prayer room and school house, and offers a permanent exhibition about the history and traditions of the Moravian immigrants. As well as models of historical buildings from the area, you can view old copies of bibles, traditional Bohemian clothing - and the curators, ancestors of old Rixdorf families, also have interesting personal stories and knowledge of the local area to share. Continue north along Richardstraße and you will emerge at a distinctly modern ensemble of buildings, beginning with one of Hans Heinrich Müller’s electricity stations (‘Umspannwerk‘). Its striking facade, with its soaring pillars and narrow windows, is in stark contrast with the old tenement houses around it. Until recently it was used by the Savvy Contemporary gallery collective, who have since moved to Wedding, though at the time of writing its fate is unknown. Slightly further on, constructed in 1908 and designed by Reinhold Kiehl, the architect behind celebrated local buildings such as Rathaus Neukölln and Stadtbad Neukölln, is the Passage Kino, a former ballroom that is now a cinema owned by the Yorck group. The upper floors today house the Neuköllner Oper, an independent opera company and music theatre that was founded in 1976 and offers a diverse selection of productions from Thursday to Sunday each week. Across the street, at Richardstraße 105, is the Antik & Trödelmarkt (Mon-Fri 10am-6pm), a half indoor/half outdoor flea market with vintage furniture, used electronics, mismatched cutlery and dishes, plastic buckets and boxes, granny-style jewellery and a huge collection of whatever that is old, but still usable. One of the best lunch spots in the area is Richi. Hidden behind Neuköllner Oper & Passage Kino hasn’t changed much since it was gourmet sandwich spot Zsa Zsa & Louis: it still has the same minimalistic wooden chairs and tables, white walls and dangling light bulbs. One of its main draws is its diverse clientele - pensioners, students freelancers, mothers with kids, the whole gamut of local life. Between 12 and 3pm on weekdays you can order from a constantly changing menu of soups, salads, bruschettas, toasted paninis, fish and more. At the weekends, their breakfasts are served from 10 a.m. to 4 pm, and there are cakes and seasonal specials. Back down on Richardplatz (Richardstraße 21), Zuckerbaby Cafe and Deli specialises in big, sweet American cakes as well as soups, quiches and other laid-back lunchtime fare. Slightly south is Barini, a great place for a lunch during summer thanks not only to their diverse ‘Italian-Turkish’ crossover menu that spans couscous and pasta, but also because you can eat and sip a home-made lemonade outside while watching locals play table tennis, admire the funky-hippy decor and soak in some local atmosphere. On the other side of the square is Mal so Mal so, an unpretentious, friendly place that offers soups and substantial dishes like goulash and chilli con carne. For trendy quick bites, Hackbert Burger has an exposed brick interior and 100% handmade burgers. Or grab a boutique sandwich from Italian street food spot Bottega No.6 (Richardstraße 6). Literature fans rejoice! 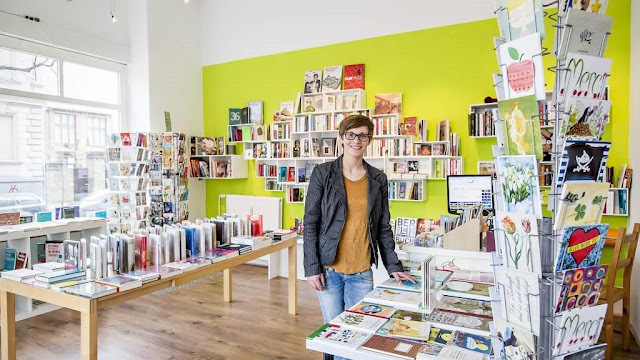 Rixdorf even has its own little bookstore in the shape of Die gute seite (the good side), whose shelves feature German and English-language books that span new and second-hand, fiction and nonfiction. Topics include cooking, DIY, travel, history (including local history), and not only are there kids books too, but at the back of the store there’s a tiny area for kids to play and a bar (‘Miss Poppins’) with coffee, cake and colourful candies. If you’re there on a Monday or Thursday you can even feast on waffles. The only other shopping is to be found at the bustling Karl-Marx-Platz every Wednesday and Saturday, where you’ll find the local Wochenmarket - fruits and vegetables at fair prices. If you’re seeking meat and sausages, you could also pop into the local butcher Fleischerei/Blutwurtsmanufaktur (Karl-Marx-Platz 9-11), which doubles as an ‘imbiss’ serving warm and savoury meals. Vegans will prefer Dr. Pogo Veganladen-Kollektiv, a shop with standard vegan groceries, cosmetics, pet food, books and a small coffee bar. Die gute Seite is actually a bookstore but has an adjacent bar that sells coffee. The classic go-to place for dinner is Villa Rixdorf, whose casual, catch-all menu offers traditional German dishes and Italian classics like exaggeratedly huge pizzas. It’s perfect in summer spot thanks to its large courtyard and beer garden. Over the road is the unpretentious Café & Restaurant Louis, mostly famous for its schnitzel, which might not be the finest but is certainly one of the largest in the city. Berlin doesn’t really do Indian food well, but Shaan offers reasonably priced and passable dishes - naans, bhaturas, masala, paneer - in a vibrant interior. In contrast to its name, Mehana Paradies is no real food paradise, but the simple but hearty dishes span ribs, chicken drumsticks and pork chops, usually served with potatoes, salad or their French fries covered with Bulgarian white salty cheese. Pretty substantial Flammküchen made out of interesting combinations of ingredients are to get in Hugo Ball (open 8pm - 2 am, Saalestraße 38). 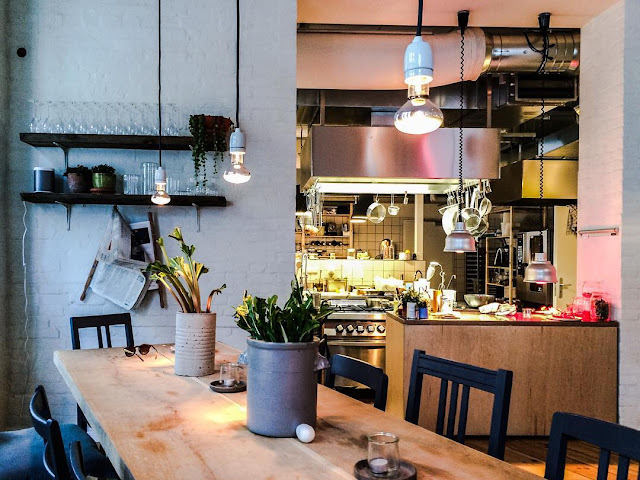 Hallmann & Klee at Böhmischen Platz is relatively new in the area, but already very busy, as the locals are attracted by delicious and beautifully served food offered by this smart restaurant. Quiet though it might be during the daytime, there are a few after dark spots worth heading to after dinner. For something local and cosy, pull up a bar-stool at the spacious, wood-heavy Alter Roter Löwe Rein, where you can ogle the deer antlers and enjoy draft and bottled beers in candle-lit atmosphere. There are concerts some nights too, and you can also find occasional stand-up comedy performances at Rotbart, a former Stammkneipe with comfortable sofas and cosy armchairs. For an aperitif, Balera Weinhandlung on Karl-Marx-Platz - open til 8pm Tue-Sat - has a fine collection of Italian wines and Prosecco on tap. Those eager to combine drinking with an electronic soundtrack - or film screenings, depending on the night - should hop into the windowless Schiefe Bahn (aka Miss Tipsy), whose speciality is ‘cava’, the famous sparkling wine from Catalonia. 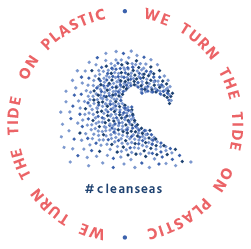 Even more upbeat - on the right night - is Sameheads, a retro-kitted dive bar and club known for its occasionally excellent club nights down in the basement. great article! lots of useful tips!